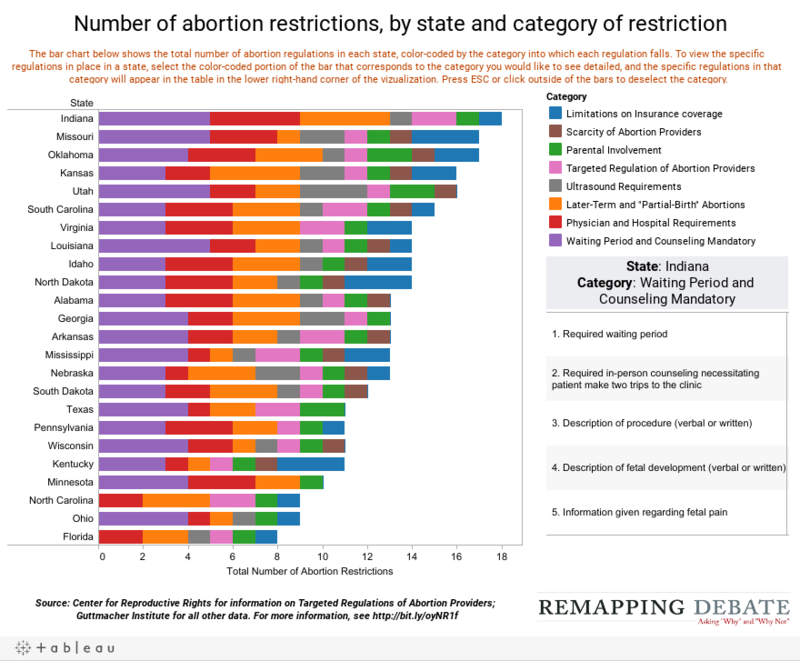 Sept. 14, 2011 — With these data visualizations, Remapping Debate identifies all of the many restrictions on abortion that have been legislated in various states. Various pro-choice advocates contacted by Remapping Debate focused on “targeted regulation of abortion providers,” or “TRAP” laws, as the restrictions with significant impact, although they were unable to provide specific studies on the extent of the impact. On the anti-abortion side, Carrie Gordon Earll, the senior director of CitizenLink, the advocacy arm of Focus on the Family, and attorneys at Americans United for Life said that studies they relied on identified parental notification and consent laws as most effective at reducing abortion rates. The chart below is organized simply by the total number of abortion restrictions in a state (coded by category, with more than one restriction possible in each category). On page 2, we present a tool by which the user can assign relative weights to the different categories of abortion restriction. Note that in this second visualization, each separate provision within a category is assigned the weight, thus potentially underweighting a category with a single, specific restriction that the user believes has significant impact. On page 3, by contrast, we present a tool by which the relative weight is assigned only to the category. Thus, in this last visualization, there is the possibility that the impact of one state that has just begun to put in place various restrictions within a category will be treated equally to a state that has numerous restrictions within that category. Note that restrictions that are the subject of temporary or permanent court injunctions have not been included. Please also review our other notes on sources and methodology.